Some time ago, during our “midweek meetings with Jakub” we had pleasure to play another Combat Commander Europe scenario – this time number 4, Closed for Renovation. Many scenarios in that game allows for free-set up within pre-defined limits and this was so in that encounter. Such game mechanic allows for large replayability of the scenarios and game itself. There is always question, how would I set-up next-time and what would I do different. 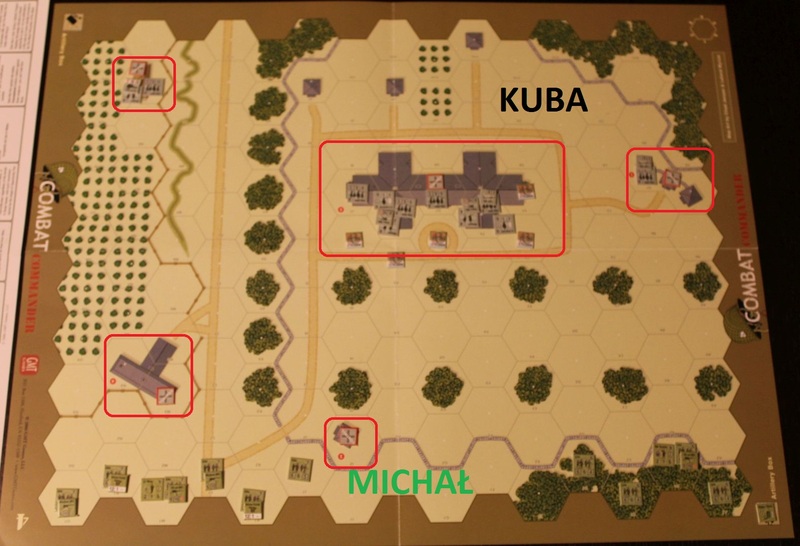 The scenario itself was a a historical encounter in 1944 in France – this is German (Jakub) vs Americans (Michal, me) skirmish. After heavy fighting, Americans managed to push Germans from the small hamlet. Well, almost ALL Germans – except for Panzer Grenadiers (elite) occupying the nearby castle. How to crush them? Of course, by sending US ELITE PANZER division elements supported by light artillery and flamethrowers. That will be an epic clash! Normally in CCE (Combat Commander Europe) the defender (Germans) set-up first and only the the attacker (USA). But in this scenario Wehrmacht has a hidden surprise – a large cannot which is placed at the end of set-up phase. Wow, that can really hinder the attackers. Americans (me) decided to lead the main attack on the left above, although they were faced by the dreadful cannon. Fortunately, thanks to smoke I was able to approach with minimal losses and win the melee against the cannon crew. 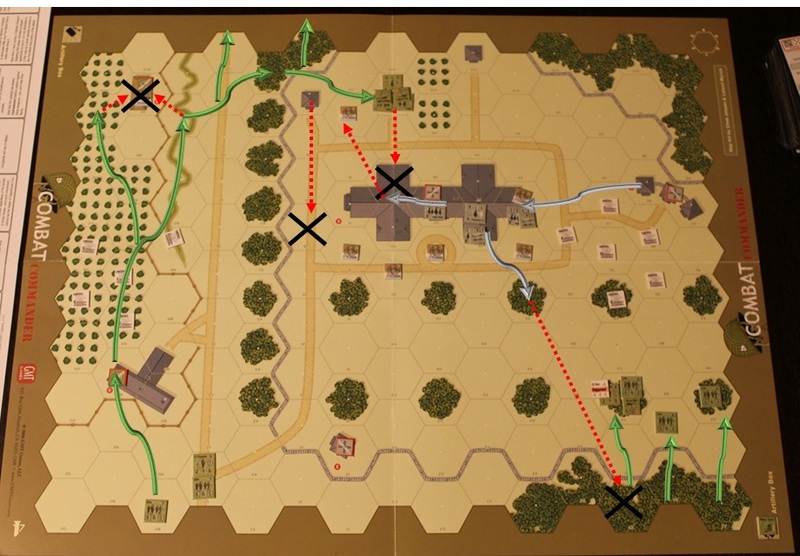 However, my focus on left flank was used by Germans who advanced on my right and successfully fired at my units. Well, after that success Germans has to retreat quickly to castle as my units started to encircle the object, eliminating single Wehrmacht units and gaining exit points. As a last resort, Germans (Jakub) are gathering all reserve units and trying to stop my advance. A violent firefight erupts which ends in total collapse of German lines, as their three units are being KIA.